I am still in North Carolina, visiting my brother before he celebrates the first anniversary of his 29th birthday. We were in the backyard of his new house, trying to identify which trees are worth keeping and which ones are worth putting out of their misery. Can anyone identify this tree for us? Are these dead flower blossoms that will be brilliant bursts of beauty next summer, or are they just signs that this tree is dying? I’m not sure, but I think that *might* be a variety of magnolia. If so, it’s very sick indeed! You might check with the JC Ralston arboretum, I think if you dig through the NC state extension website you might be able to find enough pictures to help you identify it. I have no idea about the tree, but I just celebrated my sister’s first anniversary of her 29th birthday on Saturday! I celebrated my 30th on Friday! My husband will likely know what the tree is – if I remember I’ll ask him. Or your brother can send the photo to a horticulture department of UNC or any local college. It’s not sick! 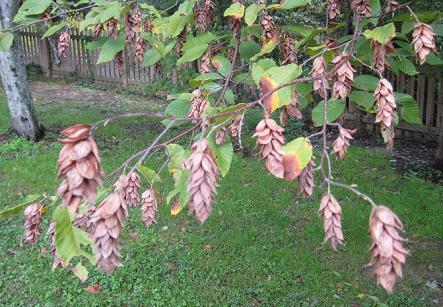 It’s a hop-hornbeam (Ostrya virginiana, http://en.wikipedia.org/wiki/Ostrya_virginiana). The brown papery things are just dried-out seed coverings (involucres, to be specific). I don’t know what role it plays in his landscape and what else he might want to put there, but he definitely shouldn’t get rid of it if his reason is that it’s sick. Flora is dead on! Just wanted to add that it is a good tree for drought areas. It’s common name is Ironwood. Here is a picture of it in spring. I think it’s rather pretty. Thanks everybody! I knew the blog would know the answer. late to the party and youve gotten yer answer. 8 years in chapel hill here. It’s amazing what the people who read this blog know! lol If it’s as pretty in the spring as the photo of it in bloom then I vote for keeping it. We call them “Monkey Puzzler Trees” due to the thorns on the trunk. They are really pretty in the Spring!